Riding the metro is a fairly mundane experience. People get on, others get off and every once in a while there's a musician singing "Besame Mucho" to break the monotony. April 18, however, was different. There was a palpable buzz of excitement as the group next to me huddled around a woman who was pointing at some photos in the newspaper. Repositioning myself to eavesdrop on their conversation, I overheard the words "red ball". No wonder they were so enthusiastic. The "RedBall Project" had just arrived in Paris and everyone was speculating about where the huge sphere would appear. Since I was on my way to its first performance in front of the Centre Georges Pompidou, I asked the woman's permission to take a photo documenting her enthusiasm about the event. According to New York artist Kurt Perschke, the RedBall Project's magnetic, playful and charismatic nature has also generated high levels of excitement at previous performances in other cities around the world, including Abu Dhabi, Sydney, Barcelona and Chicago. But most importantly, it stirs the imagination and prompts people to talk about art. As Perschke says, "people approach me on the street with excited suggestions about where to put it in their city. In that moment the person is not a spectator but a participant in the act of imagination. That invitation to engage, to collectively imagine, is the true essence of the RedBall Project." Given the company's mythique "ball and bar" logo, it's not surprising that Bacardi-Martini France invited the American artist to exhibit the inflatable ball in spots around the capital as part of its 150th anniversary celebration. During the past week, the 15 foot (4.5 meters), 250 pound red balloon has been spotted at the Passerelle Simone de Beauvoir, Canal St Martin and has even cruised past famous Parisian landmarks on a bateau mouche on the Seine. If you would like to get a glimpse of this public art project before it travels to its next destination, it will be at the Place du Commerce in the 15th arrondissement from 12:00 - 4:00 pm on Saturday, April 27, and the Luxembourg Gardens from 12:00 - 7:00 pm on Sunday, April 28. After chatting briefly with Perschke during the cocktail party hosted by Bacardi-Martini, I was pleased to bump into him at Charles de Gaulle Airport yesterday morning and to learn that the RedBall Project's next stop is Lausanne, Switzerland. As a Swiss-by-marriage, my mind started racing as I began thinking of the empty public spaces where I would display the inflatable red ball. My first choice would be floating next to the huge silver fork that's stuck in the Lake of Geneva because both objects play with scale. The artist hopes that future destinations will include Istanbul and Kyoto. Please click here to visit the RedBall Project's website and follow its travels around the world. A young woman interacting with the RedBall Project and artist Kurt Perschke. A great project to get the general public talking about art Mary Kay. You know a project is a hit when people on public transport are excited about it...and don't mind having there photo taken for it! 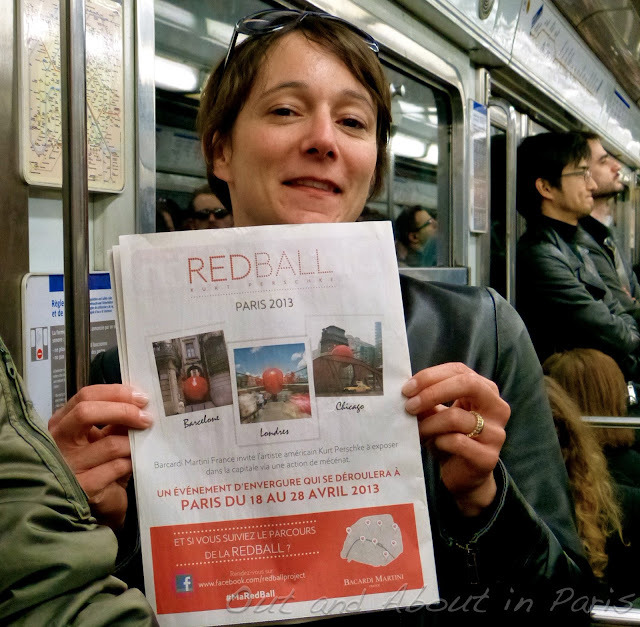 Ever since I saw the group talking about the RedBall Project on the metro, I've been wondering why there was more enthusiasm about it than about some of the other art exhibitions in Paris. Perhaps it's because the interactive nature of the RBP appealed to so many people. Plus, its location changed every day so it was a bit like a treasure hunt with a reward at the end. Thanks, Sanne. I hope that you had an enjoyable weekend, too! I thought about you the other day when I met a woman from Vienna at Versailles. While we were talking about past exhibitions in Paris, she said that she wished that there was a website that lists all of the major ones in Europe. If you know of such a website, please let me know. The woman was very disappointed to have missed the Duc de Berry's "Belles Heures of Jean de France" exhibition at the Louvre last year and said that she would have traveled from Vienna especially to see it. Really I understand the woman! Something like "Out and about Europe" would be helpful for planning what to do or see at home or on trips. Thank you so much for the feature! And thank you for coming out and about! My pleasure. Thanks for coming to Paris! It's a shame that you missed it, Denise, but I'm sure that there will be lots of other interesting events the next time that you're in Paris. There always are! Wow! You were chatting with him at the cocktail party and JUST HAPPENED to bump into him at the airport? When does that ever happen? How cool. I know this bit is off topic from your intentions of this post, but I just love stories like this reminding of how small the world is. Also, thanks for the info on the Red Ball Project! It should be interesting where it ends up next! It was a big surprise to bump into Kurt Perschke at CDG because I NEVER expect to see anyone I know in Paris. It's just too big. But airports are always an interesting exception. I once bumped into the friend of a friend while changing planes in Singapore.